In today’s world of debilitating air pollution, acid rain, toxic landfills, acidic oceans and the ultimate environmental issue, climate change, as manufacturers, we are faced with doing our part to help overcome these earth imbalance and sustainability issues. The question we must ask ourselves is: what can we do as manufacturing managers to make a difference? While the word sustainability has been used and overused and may mean various things to different people, we address a multitude of sustainability as it applies to the industrial process control industry. There is good reason to adopt a policy of sustainability as it will not only assist us in our factories being more efficient in addition to increasing our production and bottom line, but will also help to enhance our public perception as significant contributors to some of the problems listed above. Worldwide governmental trends towards increased regulations along with new labor laws and continually increasing workforce expenses is making it tougher for manufacturers and product processors to compete. Add to this hugely fluctuating and uncertain energy costs and widely swinging consumer demands for products, the manufacturing sector finds itself in one of the most difficult periods in its history. Increased public awareness as a result of our vast sea of internet-connected resources in addition to the 24 hour news cycle has the allowed the average person to remain highly informed and become active in support of sustainable practices at an ever increasing clip. Consumers are generally much more informed and in-touch with geo-politics and environmental issues than ever in the history of civilization. Consumers are not standing on the sidelines any longer but driving policy and regulations. New environmental and product quality control legislation is evidence of this. Modern industrial robotics can help manufacturers improve, not only sustainability, but better manage cost production costs and performance issues. Sustainable practices can be significantly improved through the implementation of robotic automation. Below you’ll find a list of issues supporting robotic capital expenditures. Vast improvements in product reliability and quality control resulting in improved consistency and better customer retention. The happiness of the consumer is the ultimate goal. Through increased quality and consistency through the use of robotics, customer retention is maintained thereby promoting a more sustainable business model. Worldwide, the cost of energy is increasing at an extremely high rate. 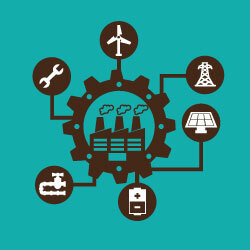 Energy cost is one of the biggest expenses in the manufacturing world. Over the last ten years, energy has increased as much as 50%. The need to reduce the use of energy as noted in a recent report by the United Nations Industrial Development Organization (UNIDO) brings this subject to the worldwide audience. The report discusses the urgent need for manufacturers to invest in energy efficient technologies in order to support sustainable growth, employment and the reduction of the effects of climate change. While many production managers errantly believe that robotics are responsible for a net increase use of energy, in the end this is not the case. The fact that robots don’t need to work in bright lighting and don’t require the level of cooling a human workforce does during winter months, results in substantial savings in energy on factory floors. The reduction of just 1 degrees centigrade in heating level can result in an energy savings of 8 percent. Some factories report that robots save energy as much as 15-30% by optimizing the manufacturing process, reducing down-time, increasing throughput and helping to eliminate start-up phases that are almost always high energy intensive events. Some extreme examples of energy savings range in the70% range through the use of robotics in cold weather climate factories. Reprocessing reduction is another benefit of robotics implementation. The increased reliability of robotics in avoiding the need to reprocess improperly made products will increase efficiency and sustainability. Depending on the industry, improper product handling and procedures can result in a significant waste of source materials, energy, time to market and supply chain fulfillment schedules. In the end the product that is not made properly the first time will result in reduced productivity, increased cost and cause sustainability to suffer. Robotics have a track record of consistent and reliable manufacturing ability that will dramatically minimize the effects of waste through reprocessing. The ability of modern robotics to be much more easily programmed to handle production line changes in products and processes allows for much shorter downtimes of factory equipment. This results in shorter change-over protocols between product process changes. The same robotics equipment can be used for multiple and readily-configured quick small change production operations. This factor as related to modern robotics automation is becoming increasingly important to maintain competitiveness and improve sustainability. The implementation of advanced robotics enables longer and more consistent production times thereby better managing customer demands for products and retention of those clients. The 24 hour production cycle is another advantage of robotics assisting with production cost reduction and better sustainability. Robots are making great strides in the areas of flexibility, maneuverability, speed, trustworthiness and other humanlike features as shown in the video below. The increased use of robotics and automation is raising serious questions in relation to lost jobs and the eventual elimination of sustainable human capital and the ability for society to remain self-sufficient and stable. There are historic examples that make for good arguments to this issue of human sustainability. Throughout the eighteen hundreds and into the nineteen hundreds, the increased use of automation in dangerous, boring and dangerously toxic environments has improved the quality of life for industrial workers by retraining and freeing the labor force up for more dignified, safer and higher value jobs. Retraining and the allocation of human resources to more advanced duties is crucial to a more adapted and sustainable workforce functioning alongside robotics. In the end the evolution of robotics leading to a much greater prominence in all industries is inevitable. The sustainability factor is one important aspect of the new age of robotics. Production managers are encouraged to seriously weigh and consider the benefits offered to your plant and our environment in the implementation of robotics in your factory. An example of the greatly improved speed and advanced capabilities of today’s robots is shown in the below video showing a competition pitting a very advanced robot against one of the world’s best table tennis players.